The report also states that, on average, grants have increased their absorptive capacity and have provided better disaggregated results to measure impact by age group and gender. At the same time, however, challenges remain in service delivery and coverage of key populations. The Secretariat has developed a new performance reporting framework which combines the reporting against key performance indicators (KPIs) and the Strategy Implementation Reporting (SIP). (See Figure 1.) Previously, separate reports were issued on KPIs and SIPs. This is the first combined report; it contains information on performance to mid-2018. 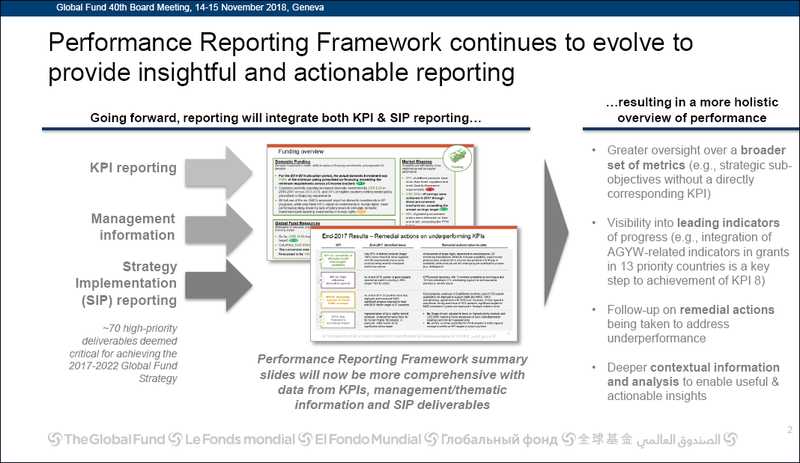 The purpose of merging the two reports is to produce a more holistic overview of performance. The Secretariat said that it welcomes comments on the presentation of the report and that it expects the format to evolve over time. The report identifies four main areas of performance –– funding, program design, implementation, and impact and results (see Figure 2). Note that for the purpose of the combined reporting, individual KPIs have been allocated to each of the four main areas. Below, we provide highlights from the report. The report consists of 65 slides, some of them quite crowded. The GFO had to be selective in terms of what we reported. More than two-thirds of the slide deck consists of an annex containing detailed KPI results; we have not reported on the contents of the annex. Our coverage is structured around the four main areas of performance and describes a small selection of the report’s contents. The report’s funding overview has three categories: domestic funding, Global Fund resources, and market shaping. Highlights from each of these follow. Domestic funding (domestic investments, ability to realize co-financing investments, preparation for transition): Minimum domestic financing commitments were met for 100% of components in the transition-preparedness cohort that has completed grant-making. A Debt2Health agreement between Spain and the Democratic Republic of Congo (DRC) was ratified, allowing the DRC to invest an additional $3.4 million in its malaria program (so far €208 million has been swapped through Debt2Health). 20 countries have started procurement of a more effective ARV, dolutegravir (DTG). However, roll-out has been slowed pending the issuance of updated WHO guidelines on whether and when the drug is safe for pregnant women. The Secretariat reported a better strategic focus illustrated by a stronger alignment of investments to countries’ needs and strategic plans. According to the performance report, the discrepancy between the Global Fund’s investments and the countries’ shares of need in the current 2017-2019 allocation is 0.36 versus a target of 0.35. The Secretariat noted that it would have achieved the target had it tweaked the formula and used the disbursement amounts instead of committed ones. In funding requests in this cycle, 2.82% of HIV grant budgets in middle-income countries (MICs) are invested in activities to remove human-rights barriers, against a target of 2.85%; and 0.72% if TB grant budgets in high-burden MICs are invested in similar activities versus a target of 2.00%. For the years 2015-2017, 75% of grant budgets for the overall portfolio have been reported as spent, the report said. This is a significant improvement over the 66% absorption rate for 2014-2016. The increase is partly due to a series of initiatives from the Secretariat (e.g. implementation for impact), and activities at country level (e.g., risk and assurance; reprogramming). The number of persons living with both HIV and TB who are given ART during TB treatment is low. In terms of operations, the report said that for the current allocation, 219 country funding requests have been submitted, resulting in 239 Board-approved grants totaling $9.6 billion, 89% of the allocation (as of 6 September 2018). Also, the Secretariat has increased its efficiency as grant-making is faster than in previous cycles: currently, it takes on average 7.8 months from funding request submission to Board approval. In addition, 72% of grants had their first disbursement decision within target deadlines. The report also said that the Grant Approvals Committee has recommended that 10 country components receive funding awards from portfolio optimization to invest in interventions on the Unfunded Quality Demand (UQD) Register. The value of these awards is $128 million. So far, the Board has approved two of the 10 awards (see GFO article on UQD). In this section, two sets of positive results stand out. The first is related to strengthening Health Management Information System (HMIS) (KPI 6d). Fourteen countries now have fully deployed and functional HMIS, up from six at end of 2017. The end-2019 target is 27 countries, meaning the Global Fund is on track. The second set is related to the improvement in data availability: 38% of high-impact and core countries provide fully disaggregated information by age and gender for relevant indicators, up from 26% at the end of 2017. The 2019 target is 50%. Regarding adolescent girls and young women (AGYW), the report revealed that 100% of AGYW priority countries with signed grants have key indicators embedded to assess coverage of AGYW with a defined package of prevention programs. 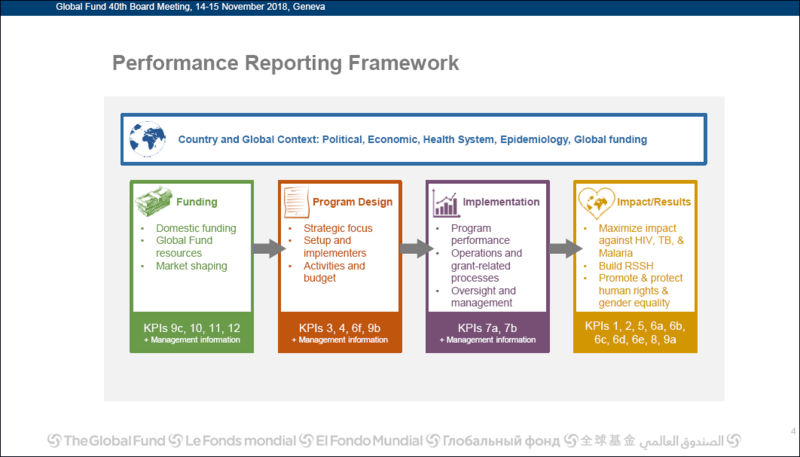 Board Document GF-B40-14, Strategic Performance Reporting, should be available shortly at www.theglobalfund.org/en/board/meetings/40.